The term "Nature Aquarium" (NA), as an aquascape style, was concieved by the photographer, author and aquascaper, Takashi Amano in the late 1980s. The fundamental principle is that the aquascape is inspired from a scene from nature itself, whether it is from a landscape or an underwater scene. Typical NA compositions will have a significant quantity of wood and/or rocks (hardscape) that form the backbone of the layout, with the plants providing a vital supporting role to bring a sense of harmony and balance. Hardscape is often covered with ferns, moss and Anubias to add a sense of "age", helping to increase the natural feel to the aquascape. Stems plants are often used to add important textures and colours, although some layouts don't use any, relying on slower growing species such as ferns and crypts. These plants are ideal for long-term, low-maintenance aquascapes. 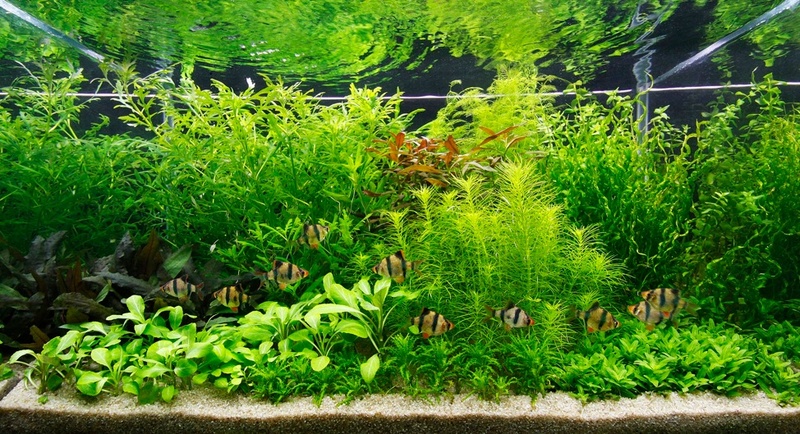 The NA style is very popular all over the world and is also known as the Japanese style, with many variations on style and technique being implemented all the time by innovative and creative aquascapers. Dutch aquariums are an older style of aquascaping, dating back to the early 20th century. The style focuses on neat rows of plants normally arranged from a central focal point, with lower plants in front and taller plants in the back, creating a sense of depth. You'll often see this described as "streets" or "avenues" using plants. Dutch aquascapes also feature more colourful aquatic plants. They can be likened to a well-kept formal garden, where all the plants are arranged with a purpose and kept well trimmed and defined. It may not be the most natural looking, but it is extremely beautiful and visually interesting - depending on taste. Stem plants are used in the main, so maintenance levels can be relatively high due to the amount of pruning and eventual re-planting necessary to keep the aquascape looking good. Wood and rocks are not usually used. The effective use of colours, textures and contrasts are the most important aspects to achieving success with a Dutch aquascape.